Two Yorkshire coast businesses are celebrating their success in the Scarborough Business Awards. 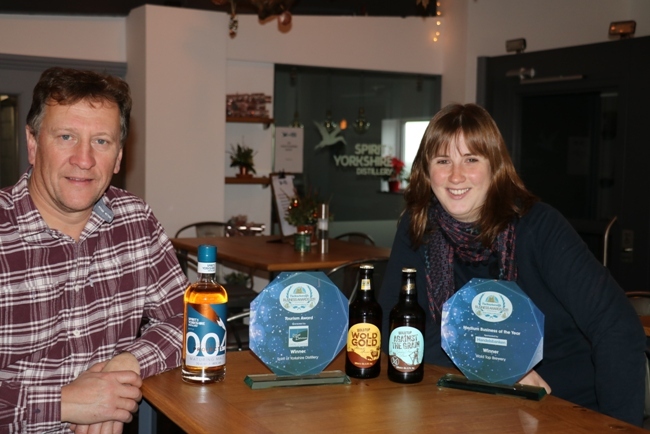 Hunmanby business Wold Top Brewery was awarded the Medium Business of the Year award and Spirit of Yorkshire Distillery the Tourism Business of the Year award at a glittering awards ceremony at the Scarborough Spa. Kate Balchin, who runs Wold Top Brewery with husband Alex, is delighted to win the prestigious award: “We have celebrated our 15th anniversary this year and our success has only been possible with the support of local people, so we’re especially proud to win this award on our doorstep. The awards, organised by The Scarborough News and its sister titles, the Bridlington Free Press and Whitby Gazette and sponsored by McCain, celebrate the businesses that fly the flag for the Yorkshire coast. In addition to distilling Yorkshire’s first Single Malt Whisky and conducting guided tours, Spirit of Yorkshire is home to the Pot Still Coffee Shop that serves a variety of home cooked food and hosts regular events including monthly Distillery Sessions and special events.